While seemingly more successful in Japan, the e-Reader was largely a failure stateside, where only a few games ever supported its functionality. One of those games was Super Mario Advance 4, an enhanced remake of the NES classic Super Mario Bros. 3. World-e is a new location added to the game where e-Card levels can be accessed. e-Reader cards for Super Mario Advance 4 came in two varieties: item cards and level cards. The former were relatively straight forward: swipe a card on the map screen to give Mario or Luigi a powerup. The latter type was the real game changer. Each level card added a new fully-fledged course to the game and each one is fantastic. Some are remakes of stages from other Mario games. Some remix elements from various games, like adding the vegetable-picking from Super Mario Bros. 2 to Super Mario Bros. 3's platforming. Many expand on Super Mario Bros. 3's design and feature even trickier and inventive new challenges. Levels like A Musical Trek and Swinging Bars of Doom focus entirely on single elements from the core game in order to create very unique platforming experiences. In total, 38 such stages were developed; dramatically expanding the number of stages in Super Mario Bros. 3 and effectively acting as the first new 2D Mario adventure since Super Mario Land 2. Just as the e-Reader anticipated the rise of Amiibo, these e-Card stages anticipated Nintendo’s later return to 2D Mario in New Super Mario Bros. and its remixing of existing Mario mechanics and assets in Super Mario Maker. The problem is, exceedingly few people have actually played through all of these levels. At the time, before online retail became the behemoth it was today, collecting the full series of cards was a challenging and pricey endeavor that required dedication and patience. Even setting that aside, only 12 of the new level cards ever released outside of Japan. In other words, even if you, a stalwart Nintendo fan, bought the game, the e-Reader peripheral, and all of the card packs released, you were still missing out on the majority of the new content if you didn’t happen to live in Japan. 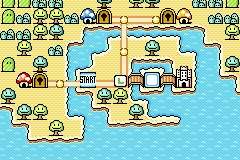 Thankfully, Nintendo managed to save these levels from being lost to time by releasing the game on the Wii U’s Virtual Console with all 38 stages unlocked from the jump. Of course, given that system’s poor sales, this still means that exceedingly few people have experienced these levels but at least it is easier than ever to access them. Let’s just hope that Nintendo decides to put the game on the Switch one of these days so this great Mario game can finally get the attention it deserves.